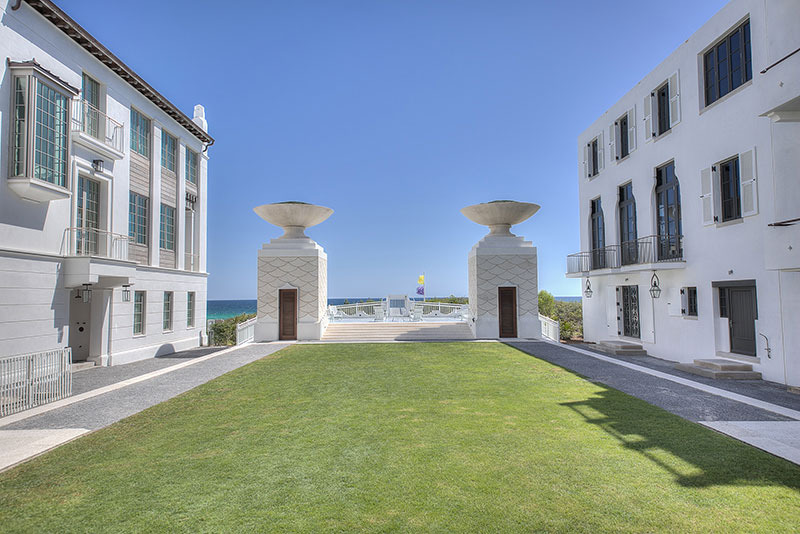 Iconic white architecture and towering palms lead to the Gulf side paradise of Alys Beach. With its lush green lawns and striking Mediterranean influenced courtyard-style homes, this stunning town’s design is based on the principles of New Urbanism. Alys Beach raised the bar on The community is the first development in Northwest Florida to be certified green by the Florida Green Building Coalition. The luxuriant zero-entry Caliza pool and its open-air restaurant are just two of the exclusive amenities available to Alys Beach residents. Explore Alys Beach, on foot or by bike, and its 1,800-foot long wooden boardwalk along the nature trail that winds through the town’s 30-acre preserve. Bask in the glow of the sun on the opulent Turtle Bale Green that harbors the beach walkover and is named for the sea turtles that nest along its shores. Dine alfresco at George’s, a 30A favorite, and choose from lobster quesadillas, jerk crusted Gulf snapper or smoked pork ribs. Alys Beach hosts a variety of events drawing crowds from across the world. Make plans to attend Digital Graffiti, the 30A Wine Festival or the over-the-top Noche de los Muertos celebration.